Before making a final purchase decision among the numerous portable generators on the market, it is essential to read an All Power America APG3004 review. The running wattage is an important aspect of performance, since it explains how many appliances will be supported by the generator. This machine supplies 850 watts of power. This means that it will be able to power lights, small appliances, or tools with ease. It is essential to understand how much power will be necessary in order to know whether or not this generator will fit individual needs. Everything that gets plugged into a generator will need a specific amount of power. During initial start up, most items require a higher amount of power, or surge watts. This All Power generator supplies 1000 peak starting watts. This generator includes a 2 stroke, air cooled single cylinder engine. It provides 1.5 horsepower to supply electricity when it is needed the most. There is also a low oil shutdown feature and auto voltage regulator. This generator includes a 1.2 gallon gas tank. There is a convenient and easy to read fuel gauge which helps a user know when a refill is necessary. Despite the small fuel tank size, this portable generator runs for up to 8.5 hours on half load. This is an example of how fuel efficient this generator will run. This is an important note in this All Power America APG3004 review, since most customers are looking to save money in all ways possible. This generator includes a recoil start. A user will be required to exert a small amount of physical energy while pulling a cord in order to crank up the engine. This is not difficult and normally begins after one pull. This generator makes little noise. It provides 65 decibels of sound, which is similar to the level of the average home vacuum. It is sure not to disturb the neighbors. 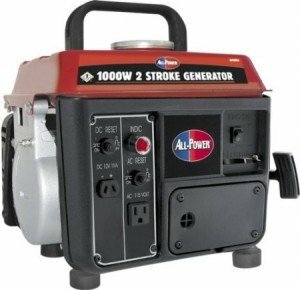 Similar to most small outdoor equipment, this All Power America generator runs on gasoline. This fuel source is readily available and can be obtained in little time when emergency strokes. Many people store cans of gas around the home as well. This All Power America APG3004 review must include the outlets that are provided on the unit. This generator includes an integrated 12 volt and a AC 115 volt outlet. This generator is not carb compliant. This means that it cannot be sold or used in the state of California. However it is accepted in every other state in the union. This generator is quite compact and easily stored. Weight: This All Power America generator weighs a low 41 pounds. This makes it extremely easy to carry from place to place without the need for assistance. This generator comes with many positive features. It is extremely lightweight and compact when space is at a premium. It includes a low oil shutdown feature which prevents engine damage when oil levels become low. There is also an automatic volt regulator system on the unit. This assures even and nonstop power production. The most common accessory purchased with this generator is a cover. This will protect the unit from outside dirt and debris. Certain people also opt to purchase a non drip gas can for cleaner refilling. There are numerous positives that must be listed in this All Power America APG3004 review. To begin, it is an excellent unit to take while camping. It is small, durable, and reliable for energy needs, especially in time of emergency. It is also at an excellent price point. The unit is just over $100, yet supplies a competitive amount power. It consumes little fuel and is safe to use. Many users enjoy the fact that it can power laptops, televisions, and satellite systems. It is also nice because this generator is quiet. The small engine and design helps to damper the sound. Certain consumers have conveyed a few negatives which should be mentioned in this All Power America APG3004 review. To begin, some users feel that the manual is a bit difficult to understand. This does not negate the fact that the unit is simple to use after it gets running. Next, due to the small size, there are certain limitations that are placed on the machine. Even though this generator is durable, it cannot compare to stronger generators with 4 stroke engines. It is impossible to power large appliances or other items which require a high supply of energy. Finally, people in California cannot use the unit since it is not carb compliant. The All Power America APG generator has received 3 out of 5 stars based on 29 customers reviews. One of the most attractive attributes of this generator is its price. The power output, excellent fuel efficiency, and compact design make it extremely worthwhile. Many experts agree that this is a good choice for the price point. Considering the fact that many people are on a tight budget, this generator will make a good investment which will afford years of reliable power backup.